A serious disorder in which the body makes sickle or crescent-shaped red blood cells (RBC). 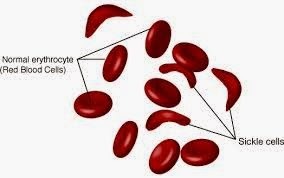 Unlike normal RBCs, sickle cells are stiff and sticky. They tend to block regular blood flow which can result in organ damage. There is a direct relationship between malaria and sickle cell trait. Tribal account for 8.6% of the total population of India but 50% of the tribal deaths are due to malaria. If a person with sickle cell trait (SCT) marries another with the condition, they are likely to pass it on their children. The government wants to identify children with SCT and through marriage counseling advise them against marrying a person with the condition. For the first time in India, the government will screen more than 5 crore tribal children for sickle cell trait, a condition that is prevalent in epidemic proportions in tribal-dominated areas and directly linked to malaria deaths in the country. Tribal children with sickle cell trait will be issued a card and given counseling advising them against marrying another person with a similar condition as this increases the likelihood of the condition being passed on. Working on the directives of PM Narendra Modi, who had ordered a similar initiative in Gujarat as state chief minister, the tribal affaire ministry will conduct a massive exercise in all states from July. The ministry will work in collaboration with state governments and conduct blood tests of all tribal students in schools and hostels to determine whether they have sickle cell trait. In the first phase, the government will screen tribal students in school and hostels managed by tribal welfare departments and then extend it to schools run by the education department and private institutions. The government has identified 10 tribal-dominated Schedule V area states as priority states -- Andhra, Gujarat, Chhattisgarh, Jharkhand, Telengana, Rajasthan, Himachal, MP, Odisha and Maharashtra. Other priority states include the northeastern states, Tamilnadu and Karnataka. The government is using the summer vacation months to train aanganwadi and health workers to conduct the blood test. These will be conducted after school reopen in July. The government will approach out-of-school children through community groups. The government's concern over sickle cell anemia or sickle cell trait stems from its links to malaria. Tribal account for 8.6% of the total population of India but 50% of the death due to malaria. If a person with sickle cell trait marries another affected person, the children have a likelihood of being born with sickle cell disease, which is very difficult to manage.